I should have been more suspect of this so-called Long Course triathlon – longer than an Olympic and shorter than a half. I thought the Santa Barbara Triathlon would be an easy-breazy beach race. With a 1 mile swim, 34 mile bike ride and 10 mile run, it wouldn’t matter that I barely trained. I bumped into my friend Liza. We knew each other in DC and she lives in Santa Monica now. She mentioned that this is a hard course – coming from Liza (an amazing athlete), I realized I might be in for a little more than I planned. The swim start was my least favorite kind – running in to the ocean Baywatch style. Fog hung low over the choppy water and the race announcers described it as slightly better than pea soup. My wave went off at 7:35 am. It was my worst swim ever. Ever. Not only was my time horrible, but my mental state was also poor. I just wanted out. My arm was getting chafed by my wetsuit/tri top (I swim in a sleeveless suit). The waves were relentless and I could barely see the buoys. And, I was thirsty from guzzling salt water each time I attempted to breathe. There was some slight relief when I took off on the bike ride. Then the hills hit – false flats, a few long climbs, and more false flats. My stomach was aching from the salt water and I could still hear the ocean swooshing in my ears. Only the avocado trees distracted me from time to time. I saw Don from GGTC at one point and Julia passed me at another. When I got off the bike, I was not sure I would be able to run. My stomach ache was terrible – I felt like a pumpkin having my insides cleaned out. I debated walking vs. running vs. quitting. I walked out of transition and started to jog lightly. The fog was lifting and with a little sunshine, I started to perk up. My stomach cramps faded and my pace picked up. Suddenly, I liked running. I even ran up the hill! And, by the last 2 miles, I remembered I was racing, and started picking off each person in front of me. I ended the race feeling strong and satisfied. It was not the best race of my life by any means. But, I’m happy I found joy in running and the willingness to keep going. Best yet, I got to spend the weekend with friends from all my triathlon communities: DC Tri, Wheelworks, and GGTC! And, we had a great time partying with the LA Tri Club on Saturday night. Categories: Races, travel | Tags: dctri, ggtc, half ironman, ocean swim, olympic, wheelworks | Permalink. This year’s Ironman Canada is just a week away (good luck to all the GGTC friends racing! )…which means it’s time to start planning for 2011! The big question – who’s with me on Monday morning to sign up? C’mon, I know there are more of you who are thinking about it…add your name to the list! Looking forward to a great training season with you. Categories: Races, training | Tags: dctri, ggtc, ironman | Permalink. I’m on my way to DC for the weekend to help out with the Dextro Energy ITU World Championship Series Race! If you haven’t heard of this race, you should check it out. This race will feature up to 130 pro athletes from all over the world. And, unlike any other triathlons, the pros can draft on the bike course. To make a whole celebration of the event, there’s an age group race on Sunday morning and an expo on Saturday. We even have grandstands set up along Pennsylvania Ave to make it easy to watch the elite athletes loop around downtown DC at record speeds. Not in DC? That’s ok! The race is being covered on live tv! Check out what Gale Bernhardt has to say, or watch the traffic on twitter this weekend (@ITUonline, @stropes, @universalsports). And of course, I need to make one last pitch – If anyone in DC has time to volunteer on Sunday, we could use your help – especially at the Finish Line! Categories: Races, travel | Tags: dctri, elitetriathletes, itu | Permalink. I spent so much time naming my new Scott Plasma (CK), I never stopped to consider that I might have some new nicknames post-accident. Apparently, I do. And, I learned them quickly on Saturday morning before the International distance Mooseman triathlon race. In no particular order, the new nicknames include: “You’re that girl!” “hey – you look great,” “wow, your face,” and simply “hey-wow!” It’s three weeks post-accident and many of my Wheelworks teammates and DC friends had not seen me since the crash when my face was an awful bloody mess. So, it was good to hear the positive responses. My favorite response was from the body marking volunteers at transition. One volunteer complimented me on CK, so I told her it was treat after landing in their local hospital three weeks ago (oh yeah, the race site was about 10 miles from Plymouth and Speare Memorial Hospital). She replies, “OH! You’re the girl that crashed in Franconia!” Either it’s a really small town up there, or there have not been many exciting accidents. Overall, I felt good. I didn’t push it at all and just used this race to regain my confidence. I might have had a little too much left at the end of the race because I really wanted to go paddle on the lake. I’m really excited to train more now and see what I can do! Kimberly and I had ice cream while we waited in line for a table at the Big Catch on Saturday night. Sunday morning, I sat on the porch of our cabin overlooking the lake and sipped a cup of coffee before heading down to cheer for the girls. I lost my cellphone while trying to capture Kimberly, AJ, Julie and Angela on film crossing the finish line. The race crew found it – and the announcer called my Mom and Dad! I got the phone back, and reassured Mom and Dad that I was OK, not off to a hospital again! All my DC girls had PR’s on the Half Ironman course! Woohoo! Can’t wait to cheer them on in Placid! Oh, and if any of you are ever thinking about doing Mooseman, Timberman or any other race by Keith Jordan, you should definitely sign up. The race was extremely well run: great volunteers, great food (ice cream and maragaritas! ), good signage and great t-shirts, hats, etc. I’ll be at Mooseman next year for sure. Categories: FamilyFriendsFans, Races, training, travel | Tags: dctri, mooseman, wheelworks | Permalink. I’m heading up to New Hampshire for the Mooseman Triathlon this weekend. This race is full of a lot of “firsts” for me. So here goes the list. Full Olympic distance race: 1.5K swim, 44K bike, and 10K run! I kinda skipped over Olys in the past few years, only swimming in a relay last year. Race on my new tri bike! 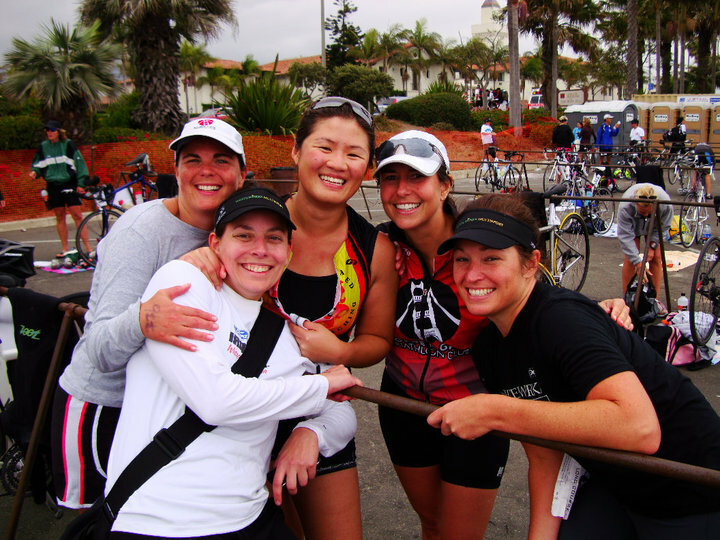 Race with my good college friend Amy – and her very FIRST triathlon! 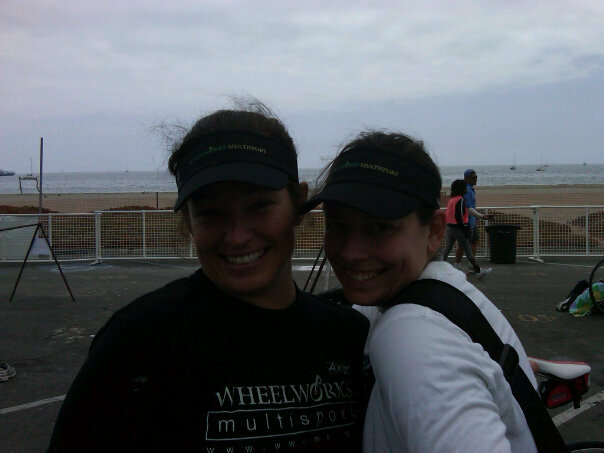 Joint club/team race – I’ll be cheering for and racing with friends from DC Tri and Wheelworks Multisport. I wonder which team’s tri top I should wear? I’m excited and nervous, but mostly just looking forward to an awesome weekend of playing outside with great friends. Categories: FamilyFriendsFans, Races, travel | Tags: dctri, mooseman, wheelworks | Permalink. Between tapering this week and thoughts of life post-Ironman, I can’t help but think about what I will do on July 21st and every day after that. Jim and I spent a fair amount of our Sunday morning run from the Capitol to Georgetown and across the river wondering just that. Will we keep training? Will we do another Ironman? Or will Jim return to his focus on running, me on swimming, and so on? New Jersey State Triathlon July 27th – Don’t worry, I’m just racing the swim portion of an Olympic Relay! I’ll spend the rest of my time there volunteering and cheering on the 200+ DC Tri Club participants! Recruit volunteers and assist with the volunteer coordination for Nation’s Triathlon in DC, September 14th. You should volunteer! August/September backpacking trip in Boulder! September cycling trip on Martha’s Vineyard! I’m considering doing one more race too. Maybe an olympic or sprint distance? Any suggestions for one in late August or September? Categories: IMLP, Logistics, Races, training, travel | Tags: dctri, Races, swimming, training, volunteer | Permalink. I wake up hungry. I have no need for an alarm clock – my stomach gurgles and aches without fail between 5:30 and 6:00 am. The hunger pains are so strong, I feel like my stomach must be ready to eat my other muscles and organs. I think about food constantly – what will best keep me going on an 80 mile ride or even through a long meeting at the office after an hour and a half morning swim? I found myself ducking out of a meeting at work this week to “use the restroom,” which actually meant stopping by the kitchen to scarf down half a turkey sandwich! Eating every two to three hours is a necessity for me. While nutrition experts are debating about the need for carb-loading, there’s no doubt I need lots of food, all the time! So, I’m pleased to report that the 4th of July was the best training day yet – and not because of the 50 mile Seneca training ride with the tri-club! I ate enough for the first time this week to sleep more than 5 hours! Thanks to Stephen for hosting a rooftop bbq where I filled up on 2 cheeseburgers, potato salad, cucumber salad, a hot dog, and lamb skewers! Oh, and making and bringing these two desserts – a nectarine-rasberry crisp and celebration cake – definitely helped! I didn’t even have to have my usual bowl of grape nuts or cheese stick before bed! Given the remainder of my workout schedule for this weekend, I doubt my stomach will remain satisfied. What is your favorite late night snack to curb hunger and get to sleep? Categories: FamilyFriendsFans, training | Tags: cycling, dctri, Nutrition, sleep, training | Permalink.